A census of the population of England and Wales has been taken every ten years since 1801, with the exception of 1941. The 1841 census was the first to record the names of every individual. We have used it for our study because it allows us to associate many of the households with a property recorded on the tithe apportionment of a year or two earlier. The date on which the census was taken was 6 June. Only the names of individuals actually present in the house on that day were recorded. The enumerator delivered a form known as a schedule to each household a few days before census night, and collected the completed form the day after. The schedules were then sorted and copied into the enumerators books. It is those books that survive in The National Archive. Barcombe was divided into three enumeration districts each of which was the responsibility of an enumerator. One district encompassed dwellings lying to the north of the road at Barcombe Cross and land to the west, including Sewells Farm, Cooksbridge and Holman’s Bridge. Another contained dwellings to the south of the road of Barcombe Cross, the area round the parish church, the mill and dwellings lying south of the road to the Anchor. While the third covered the north of the parish, Balneath, Spithurst, Town Littleworth, Sharpsbridge and all dwellings north of the road to the Anchor. An address of sorts was shown for each household but house numbers were rarely given, and in rural areas frequently only the name of a village or hamlet is recorded. In Barcombe no house numbers were used, a few farms or notable houses were individually named, but by far the greater number of dwellings were only recorded under the general names or descriptions of settlements – Spithurst, nr Burtenshaw’s, Holman’s Bridge, Barcombe Cross for example. In Barcombe the number of households recorded in the census outnumbers the dwellings recorded on the tithe map of one year earlier making the task of assigning families to a property very difficult. When the families can be associated with the owners or tenants of property recorded on the tithe map identifications are certain, many others remain doubtful. The census information attached to the tithe data pages of this website uses italics for uncertain identifications. 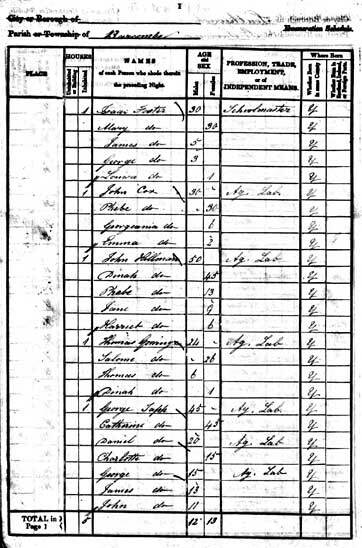 First page of 1841 Census, Barcombe.